A hungry female mosquito (male mosquitoes don’t bite) recognizes and finds a human being from a relatively long distance by the breath and skin scents. The most important component of breath is carbon dioxide (CO2), and it is used by most mosquitoes as a major host-finding cue. In addition to carbon dioxide, there are also certain components of human skin scents that provide important information to mosquitoes in their search for blood. Among others, these are lactic acid, different fatty acids, or ammonia. Asian tiger mosquitoes (Aedes albopictus) and dengue / yellow fever mosquitoes (Aedes aegypti) are very much adapted to the human environment, especially target humans and do not rely on carbon dioxide as much as other, more generalist mosquito species. This is why they can be attraced sufficiently well just by human skin odours. The BG-Sweetscent is a pouch containing a proprietary formulation based on lactic acid which mimics human skin scent. All components are in food grade quality. Using BG-Sweetscent in the BG-Mosquitaire mosquito trap makes the trap attractiveAsian tiger mosquitoes and dengue / yellow fever mosquitoes. The BG-Sweetscent is registered by the United States Environmental Protection Agency (EPA), registration number 87472-1. The BG-Sweetscent was developed through extensive laboratory and field testing. Numerous peer reviewed scientific articles have been published documenting the effectiveness of the attractant. Additionally, scientific studies show that using BG-Sweetscent in a variety of other commercially available mosquito traps can increase catch rates of mosquitoes that transmit diseases like Dengue, Zika or Chikungunya by up to 4 fold. BG-Sweetscent is the first attractant targeting Aedes aegypti and Aedes albopictus that has been scientifically proven to work with many different traps. The BG-Sweetscent mimics human skin scent. It is a pouch containing a proprietary formulation based on lactic acid. Combining BG-Sweetscent with the trap’s patented attractive technology of ‘heat convection’ and ‘light-and-dark-contrast’ make it especially effective in capturing tiger mosquitoes. The BG-Sweetscent is to be used with the BG-Mosquitaire or other traps that attract host-seeking mosquitoes. For the BG-GAT, the attractant is not recommended. Important: Do not open the sachet! Place the BG-Sweetscent sachet inside the BG-Mosquitaire trap in the holder provided. 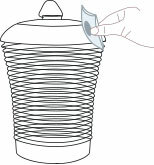 If you use the BG-Sweetscent with another mosquito trap, a round sticky tape allows attachment of the sachet on any mosquito trap. Just pull off the film from the round sticky part on the sachet and press the BG-Sweetscent onto the trap. The BG-Sweetscent can be placed inside the trap, on top, or under the roof depending on what trap model is used. Degener CM, Geier M, Kline DAN, Urban J, Willis S. 2019. Field trials to evaluate the effectiveness of the BG-Sweetscent lure in combination with several commercial mosquito traps and to assess the effectiveness of the BG-Mosquitaire trap with and without carbon dioxide. 35(1):32–39. doi:10.1038/s41598-018-34161-9. 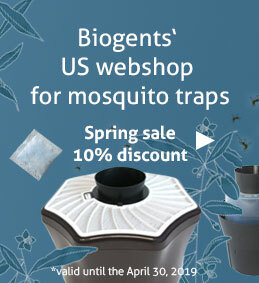 Our US webshop mosquitotraps.shop is now open! If you are located in the US, the BG-Sweetscent can be ordered fast and conveniently through the new US webshop. Please note: not for sale in California! Prices can be found in our US webshop.